Work is being carried out to replace the ferry chains which provide an essential link between two areas of Cornwall. There has been a river crossing between Philleigh on the Roseland Peninsula and Feock near Truro since the 15th Century. And the King Harry Ferry has been running on the Fal Estuary for well over 100 years. 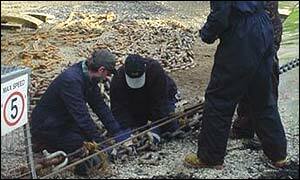 But since it switched from being a steamboat to a chain ferry in the 1950s, replacing the chains has been regular and time-consuming job. During the next fortnight, while the ferry is having its annual service, a new chain will be strung across the 70-feet deep estuary. The work leaves the hundreds of commuters and tourists who rely on the Ferry to take the much longer road route to and from the Roseland. "The reason we have to replace the chains is because they do wear out," said Tim Light, managing director of the King Harry Ferry. "The chain we are replacing went into service three years ago and it has literally worn out."